Mill and lathe combo for making custom parts and machining custom firearms. 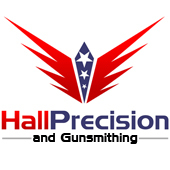 At Hall Precision, not only do we make custom firearms and holsters but we also have a wide variety of firearms and accessories to meet you needs as well as offer gunsmithing services for your favorite firearm. We can do just about anything you need to your firearm, from sight installs, break fixes, to full restorations. What ever you need it be, home defense firearms, long range precision rifles, or just properly fitting accessories for your firearms we provide the best selection with the best prices that we can. We also offer firearms training courses for Virginia concealed carry permits, basic firearms training and more. Take a look at our selection of firearm training courses, and training schedule to get yourself a spot. Take a look at our latest gun show schedule to see when you can meet up with us again on the road!